Magazines come saddle stitched/stapled. Looking for Coil/Spiral/Wire-O Binding? Get a Custom Quote. 4,000 and under Magazines: Ships or ready for pick up in 2 business days from proof approval. Over 4,000 Magazines: Ships or ready for pick up in 5 business days from proof approval. Magazine printing - make high quality impressions with readers! Glossy, full-color magazines are an ideal means of regularly connecting with readers. 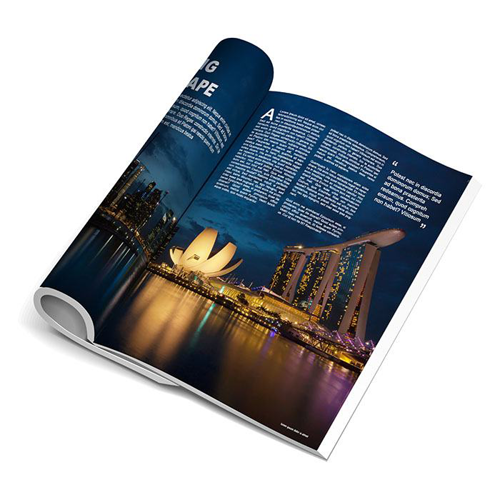 When you choose the online magazine printing service of 48HourPrint.com, you can be confident that you're getting high quality magazine printing at very affordable prices. In addition to excellent quality and prices, the convenience of our industry-leading 48 Hour Turnaround Guarantee gives you fast turnaround in getting your magazine printed and out to readers. Magazine printing lets you share important news, compelling stories and vibrant photos. The magazine printing service of 48HourPrint.com handles full-color magazines from 8 to 48 pages, letting you share shippets, eye-catching visuals and in-depth news with readers. Whether you print your magazine weekly, monthly or quarterly, we can help you reach readers right on schedule with our printing and mailing services. The online magazine printing service of 48HourPrint.com makes producing and delivering a magazine a smooth process. Magazines are printed on 80# text stock with gloss coating or matte coating and are saddle stitched. Check out our magazine templates for layout guidelines that will help keep your project on schedule.